Photo courtesy Fermi National Accelerator Laboratory. Psych! Actually, it was a 50-foot-wide magnet for a particle accelerator, and it’s way harder to move than a UFO. Stuffed with superconducting coils, the ring can’t twist or bend by more than 2 millimeters. 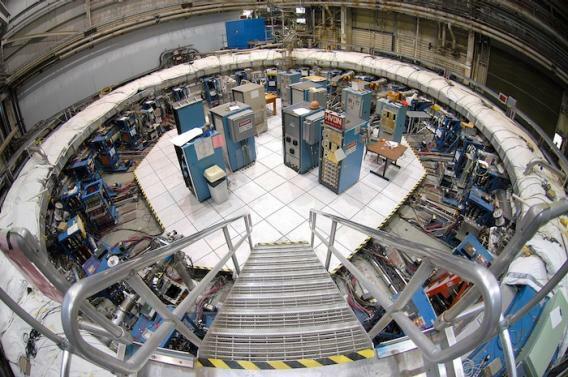 That’s not really an issue when it’s quietly collecting subatomic particles at a physics laboratory, but it’s a big deal now that the magnet is moving from Brookhaven National Laboratory in Upton, N.Y., to Fermilab outside Chicago. The ring’s jaunt on the William Floyd was just part one of an epic 3,200 mile voyage, most of which will take place by barge. After being lifted onto the barge by crane, the ring sailed down the Eastern Seaboard and rounded Florida. It switched tugboats in Mobile, Ala., over the weekend and is currently making its way up the Tombigbee Waterway. Soon, it’ll meet the Mississippi River around St. Louis, then take a right into Illinois. Once the barge docks, another truck will spend three nights towing the 14-ton magnet through the Chicago suburbs to Fermilab. All told, the move costs $3 million and has required years of planning by dozens of physicists and engineers. So why are they going through all the trouble? The magnet is the key component of a physics experiment called Muon g-2 (pronounced “gee minus two”), the first incarnation of which ran at Brookhaven from 1999 to 2001. Physicists used the one-of-a-kind magnet to trap subatomic particles called muons and measure how a property called their “magnetic moment” was affected by the ghostly presence of virtual particles popping in and out of existence in the vacuum around them. (Quantum mechanics is weird like that.) The answer the team got differed from the number predicted by the Standard Model, which could mean that there are some virtual particles out there that physicists don’t know about—or it could be a meaningless statistical blip. Brookhaven’s particle accelerator couldn’t produce enough muons to find out for sure. 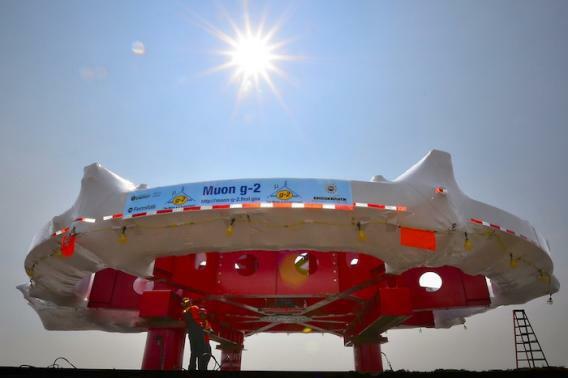 So the Muon g-2 team is moving the whole experiment to Fermilab to try again with more muons and, the scientists hope, maybe win a Nobel Prize or two. And really, the $3 million price tag is a steal—it would cost more than $25 million to build a new magnet. Helping the physicists in their quest is Emmert International, the heavy haul transportation company that steered the Levitated Mass boulder through the streets of Los Angeles last year. 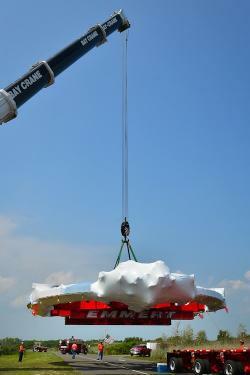 They engineered the red transport fixture that sits inside the ring and holds it steady throughout the move. The transport fixture alone weighs 40 tons. 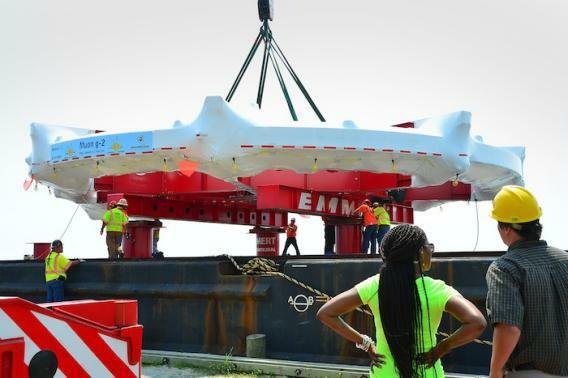 The ring’s departure from Brookhaven was delayed by one week because of bad weather, and the barge had to spend five nights near Norfolk, Va., waiting out a storm. Still, it’s on track to arrive in Illinois during the week of July 22—well before the physicists need to start worrying about hurricanes. 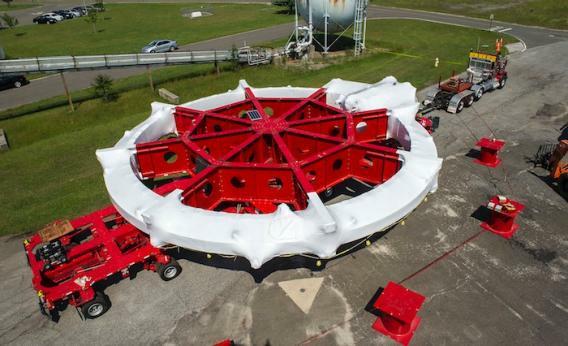 A Fermilab spokesperson says he expects the magnet to be safe and sound at its new home by the end of July. In the meantime, you can track its journey here. This post has been updated to reflect the current location of the ring.